ORU Market, ORU Marketplace, ORU Pay, ORU Chat, ORU Mail, ORU Social, ORU Quantum Widget, ORU Score, Infinity Reward, ORU Rewards, ORU Health, ORU iOS App, ORU Android App, ORU Debit Card, ORU Card, Gizmoh.com are intellectual properties owned by Azteya Ltd and its affiliates. Azteya Limited is headquartered in George Town Grand Cayman. Azteya Limited has a website but there’s nothing on there other than a login form. As far as I can tell, Azteya Limited is nothing more than a shell company. There is no legitimate reason for an MLM company to be incorporated in an offshore tax haven. Heading up Oru Marketplace is “architect” Nick VandenBrekel (right). Nick is a seasoned serial entrepreneur, technology and financial services innovator and military veteran. With over 38 years of experience in myriad aspects of technology, science, finance and business, he has been responsible for, and has contributed to ground breaking technologies in the communications, financial, banking, medical, hardware, software, security, social media and enterprise systems industry. In his ORU Marketplace corporate vio, VandenBrekel is cited as “a native of the Netherlands”. Corporate records however suggest VandenBrekel is based out of the US state of Florida. It follows thus that ORU Marketplace is also likely being operated out of Florida. Despite the lofty claims made in VandenBrekel’s corporate bio, I believe ORU Marketplace is his first MLM venture as an executive. Read on for a full review of the ORU Marketplace MLM opportunity. ORU Marketplace has no retailable products or services, with affiliates only able to market ORU Marketplace affiliate membership itself. ORU Marketplace affiliate membership provides access to a Visa prepaid card, social network, travel discount portal, discount prescription service and an advertising platform. Visa Prepaid Card is issued by MetaBank, 5501 S. Broadband Lane Sioux Falls, SD 57108, Member FDIC, pursuant to a license from Visa U.S.A. Inc.
ORU Marketplace affiliates sign up for $30.94 and then pay $5.95 a month. ORU Marketplace affiliates are paid $10 per affiliate they personally recruit. A residual $1 recruitment commission is paid on affiliates recruited by personally recruited affiliates (level 2). ORU Marketplace pays residual commissions via a unilevel compensation structure. ORU Marketplace caps payable unilevel team levels at ten. Residual commissions are paid based on monthly fee payments made by directly and indirectly recruited unilevel team affiliates. For each affiliate placed into the unilevel team that continues to pay their monthly $5.95 affiliate fee, a 25 cent monthly residual commission is paid out. ORU Marketplace affiliate membership is $30.94 and then $5.95 a month. ORU Marketplace initially launched on or around January 2017, if not earlier. The original concept heavily pushed ORU Marketplace’s social network. That flopped and so now ORU appears to have rebooted itself with a not-so-publicized focus on unregistered securities. Before we get into that though, by paying out commissions on ten levels ORU Marketplace is very much an MLM company. Yet despite the obvious, ORU Marketplace goes hard on the “we’re not an MLM company” denials. Is ORU an MLM company? The ORU Market is not an MLM ( Multi Level Marketing, also known as Direct Sales or Network Marketing) Company. ORU Market is an Enterprise Software and Information Technology company that offers its software capabilities by subscription to its members on a non-exclusive license basis. In a typical MLM company the company distributes its own products through a network of distributors who earn income from their own retail sales of product and from the retail sales made by the distributors direct and indirect recruiting of others. (c) receive compensation, in whole or in part, based upon the sales of those in the participants downline, tree, cooperative, income center or similar program grouping. That is MLM defined. ORU Marketplace charges affiliates $34.94 to sign up and then $5.95 a month, so the above claims by the company are outright lies. ORU Marketplace’s compensation plan has nothing to do with retail sales. 100% of commissions paid out are tied to affiliate recruitment and continued payment of affiliate fees. In MLM this is known as a pyramid scheme, hence ORU Marketplace’s desperate denials. Desperate denials don’t change the fact that ORU Marketplace uses an MLM compensation plan and therefore is very much an MLM company though. Behind ORU Marketplace’s pyramid scheme front-end appears to be yet another entry into the MLM cryptocurrency niche. As per ORU Marketplace’s website, ORU Quantum is ‘the official community currency of the ORU Market‘. From the screenshot above, ORU Quantum looks like an internal exchange for ORU points. 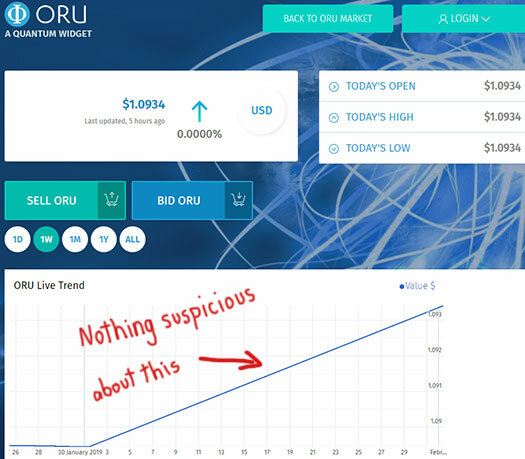 ORU is not publicly tradeable and exists solely inside ORU Marketplace itself. That is to say that if ORU Marketplace collapsed or was shut down by regulators tomorrow, ORU points would cease to exist. In this sense ORU functions more as Ponzi points, with ORU Marketplace dictating the price its affiliates can buy and sell points at. So why would regulators want to shut this down? By offering points affiliates can invest in and later cash out at a higher value set by the company, ORU are offering affiliates an unregistered security. ORU Marketplace affiliates invest in ORU points, ORU Marketplace increases the internal value of the points and affiliates who’ve invested can then cash out. This is entirely passive on behalf of the affiliate, who relies on ORU Marketplace to arbritrarily set the internal ORU value as they see fit. In order to operate legally in the US ORU Marketplace would need to register their securities offering with the SEC. As I write this neither ORU Marketplace or Nick VandenBrekel are registered with the SEC. This means that irrespective of anything else, ORU Marketplace is operating illegally in the US. Delving further into ORU points, withdrawals are possible for as long as new affiliates are willing to invest. And with new investment literally being used to pay existing affiliate returns, ORU Marketplace thus functions as a Ponzi scheme. Both ORU Marketplace’s pyramid membership fee commissions and ORU points returns are dependent on perpetual recruitment of new ORU Marketplace affiliates. Once recruitment dies, monthly fees stop getting paid and ORU Marketplace affiliates won’t be able to cash out their ORU point balances. As per the ORU points chart screenshot provided above, ORU Marketplace appears to have launched their ORU points scheme in a few weeks ago. Regardless of whether the SEC goes after ORU Marketplace, the math behind pyramid and Ponzi schemes guarantees that the majority of participants will lose money. The ORU Market is not an MLM. Sounds like that gold site, Karatbars. does anyone know ORU’s office address in Florida? DOCUMENT# P16000080056 Entity Name: ORUMARKET INC.